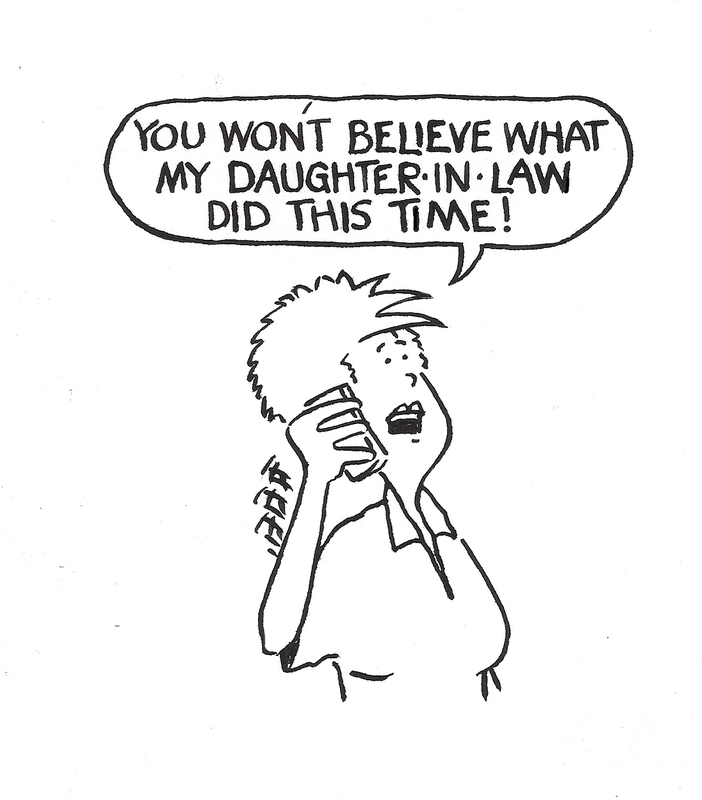 Negative In-Law Talk – Make It Work for You! When you struggle over and over again with your mother-in-law or daughter-in-law it is often hard to find something positive to say about her. All you can see are the things she does that drive you crazy or make you feel as though your life is nothing but misery – at least with her. As I’ve mentioned in previous posts this negativity can make it difficult for you to see how you can change this relationship. This negativity, however, does more than block your ability to create the relationship you may want. This negativity also impacts your other relationships. Depending on if you are a mother-in-law where you would be impacting your other adult children, grandchildren as well as other family members and friends, or you are a DIL who would be impacting your parents, siblings, sisters-in-law, along with your husband and your own children, this negativity is detrimental to everyone involved. Loyalty – You vs. Her? We often want to believe we are just venting when we talk openly about how our in-law makes our life miserable or even impossible, but we are doing more than that. If you think about it for a minute, when you are venting about your in-law, sharing all the gory details about what she did to you and how that hurt or upset you, you feel better, right? Great! But what about the people you have imparted your woes to? How do you think they are feeling? These people are left with an image of your in-law that will make it difficult for them to see her any other way than the way you’ve painted her. Or in the case of the people who also love this her – whether she is their grandmother, mother, sister-in-law or mother-in-law – they will be struggling with how to make sense of how you have painted her vs. how they may view her. These people will feel caught in the middle, struggling with what to do with all this information. They will feel caught between how they feel about her and how you portray her to be. Do they feel as though they have to choose between you and her? Another aspect about all this negativity is how it can change these other people’s view of you. 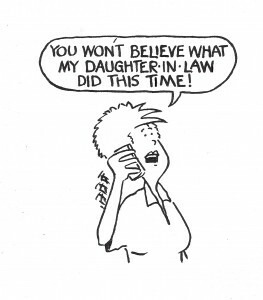 If every time you talk about your mother-in-law or daughter-in-law it is something negative about what she did or didn’t do, how she spoke to you or didn’t speak to you, how do you think these people now view you? Do they see you as a negative person? Do they see you as a victim, complainer, or maybe a glass-half-empty kind of person? Does behaving like this around others have them keep their distance from you? Think before you share. Pick and choose carefully the people with whom you want to share this painful experience. Think about which person or persons will be the most helpful to you to share with, but also to help you work through it. If you are going to share negative things about your in-law, that’s fine, but either ask for advice or talk about what you are going to do to try to change things. Don’t just share the problem; be looking for solutions as well. When others share their thoughts – whether it is about your actions or your in-law’s actions – listen…really listen to what they say. It is easy to dismiss their thoughts with, “Yes, but…” or “I’ve tried that, and it didn’t work.” If you are honest with yourself, those words really are a way to dismiss any possibility of positive change. So go ahead and express your frustration about your in-law’s actions, but don’t stop there. Look for ways to make things better, which means looking at yourself and what you can do differently to begin the process of change.